With 25 family members, we descended into the nooks and crannies of Cuba with great admiration for the residents while learning about their endurance over 5 tumultuous decades. 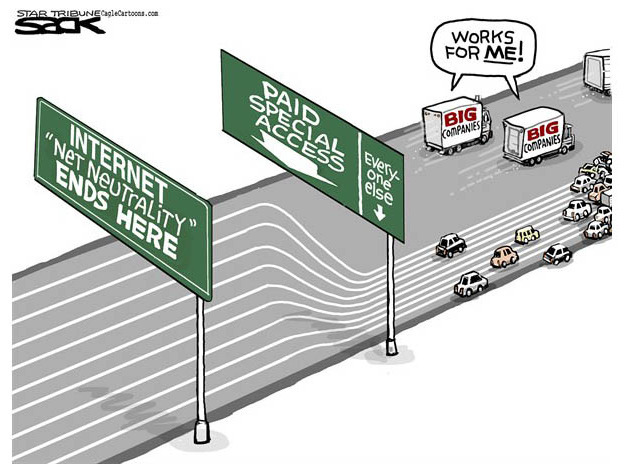 Though the tides are slowly changing as our US government treads a new relationship path. These negotiations bumped us from our hotel as Nancy Pelosi and her crew were roaming the Island (while staying in our hotel) and discussing efforts to lift the long overdue embargo. Cuba is a beautiful dichotomy. It is rich in culture yet poor in wealth with friendly people who are sadly isolated and a swim’s distance to Key West yet oceans apart. I learned that (despite last week’s musical inclusion), Dezi Arnez is completely unknown in his home country since his career was launched after he left (and never returned) and Cubans didn’t have access to American Television. 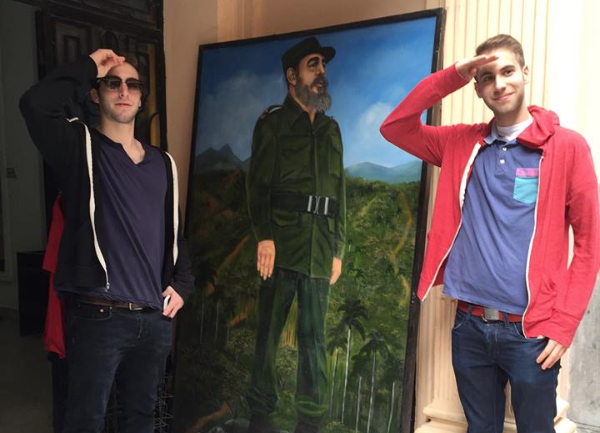 Cuban culture is stellar. The music is toe-tapping/Salsa-Dancing everywhere…lunch, dinner, night clubs with the highlight at theBuena Vista Social Club. The variety of architecture is stunning yet with some magnificent building so neglected and decrepit trees were growing from their roofs. Their art community is incredible with Yoan Capote as our favorite. Delicious meals consisted of Rice, Beans and Rum with tasty Fish and Chicken sides. Public toilets lacked TP and Seats but for a “cuc” (Tourist Pesos) attendants came to the TP rescue. Their roads are filled with Woodward Dream Cruise cars of every hue and the Jewish Community is warm and welcoming as we shared Friday night services and Shabbat dinner with them. The songs were familiar and the service was led by young Cuban Jews. 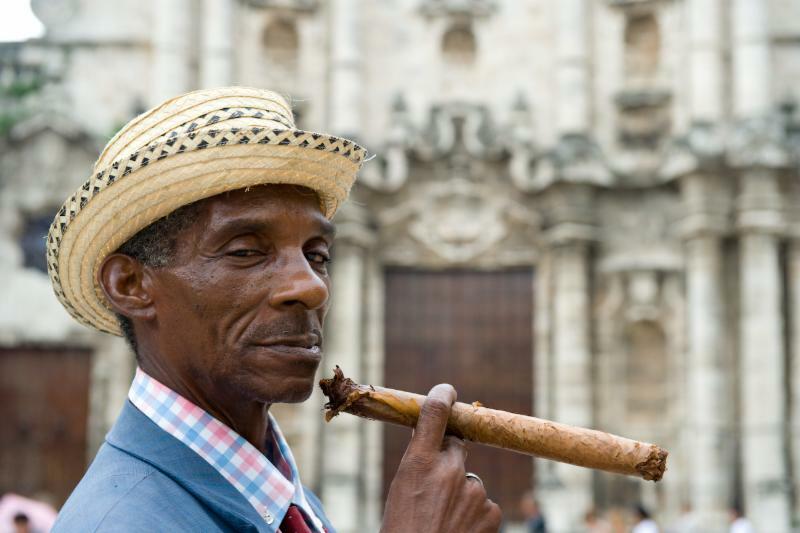 I highly recommend a visit to Cuba and now is the time, before it becomes commercialized and western. 1. Give gifts/charity to those in need. 2. Attend a reading of the Megilla (story of Purim). 3. Partake in a family/community Purim meal. 4. Send gifts of food (Mishloach Manot) to friends/family. 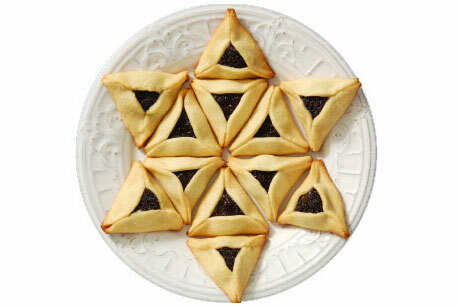 We indulge in eating 3 cornered cookies, Hamentashen, representing the 3 cornered hat worn by our Purim nemesis, Haman. Obama Vetoes: 3 with the 3rd this week for the Keystone Pipeline, though I assume more are coming down the pike. Recreational Weed: 3 States with Alaska joining CO and WA this week. Many others including MI legalized medicinal marijuana. Marriage Equality: 37 States with a Supreme Court decision regarding Michigan (and other States) expected in June. Damages Awarded: $655.5 Million by a Manhattan Jury against the PLO and the Palestinian Authority for their involvement in terrorist attacks that killed Americans in Israel. Gun Violence: Women are 10 times more likely to be murdered in the US than in other Western Countries. National Monuments: Obama created 3 new ones includingBrowns Canyon in Colorado, Pullman Historic District in Chicago, and Honouliuli Internment Camp in Hawaii. 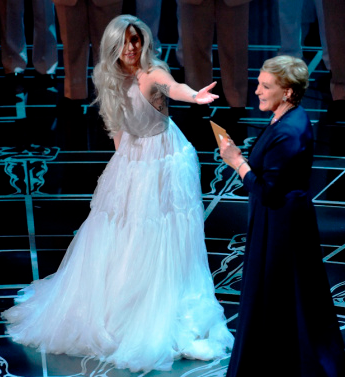 After months of rehearsal and practice, practice, practice, Lady Gaga nailed this Sound of Music tribute. During one of our Cuban dinners, we met the lovely Ambassador from Nigeria who is this week’s Shabbat Shalom Guest Greeter. She was a fascinating woman with some sad tales of the devastating tragedies inflicted upon her people by the demons, Boko Haram. Wishing you and your loved ones a Sweet and Peaceful Shabbat Shalom and a Hag Purim Sameach! 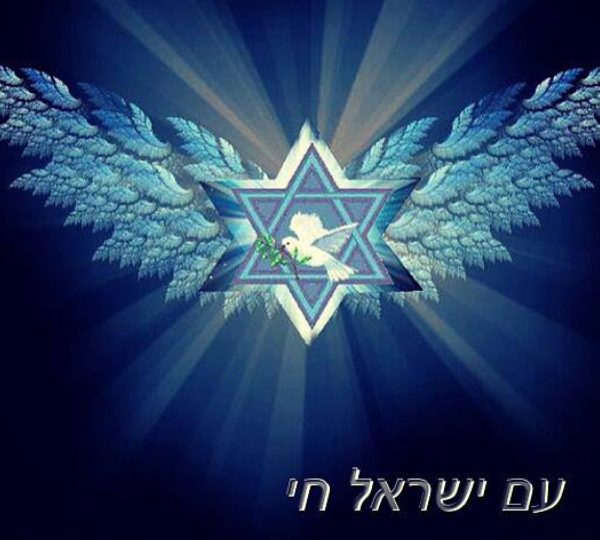 Condolences to dear friend, Sherry Margulis Zaslow and her family on the passing of their beloved Father and Grandfather,George M. Margulis z”l. His heart was beaming with pride and love for his wife Marilyn and children Sherry (and the late Jeff Zaslow z”l), Randy (Deborah) and the late Dale Margulis z”l in addition to granddaughters Jordan, Alex and Eden Zaslow and Jayde and Lily Margulis May his memory and spirit bring comfort to those who loved him. Our thoughts and prayers are with Roya Soleymani and Bryan Weinstein and their family on the passing of Roya’s father Sion Soleymani z”l. May his memory be a blessing onto his family and bring comfort to them during their time of mourning. The Danish security guard who was shot at point blank while protecting a Bar Mitzvah celebration at his Danish Synagogue. 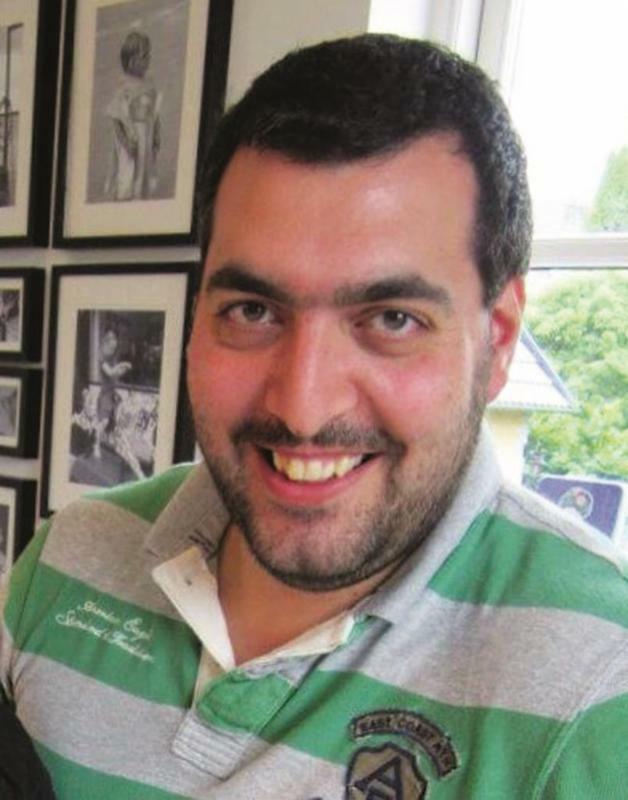 The 37 year old hero was a gentle giant at 6’5” who was beloved by his community both in Denmark and Israel. He was an avid basketball player and to his friends was known as “Dan the Man”. Rest in Peace. 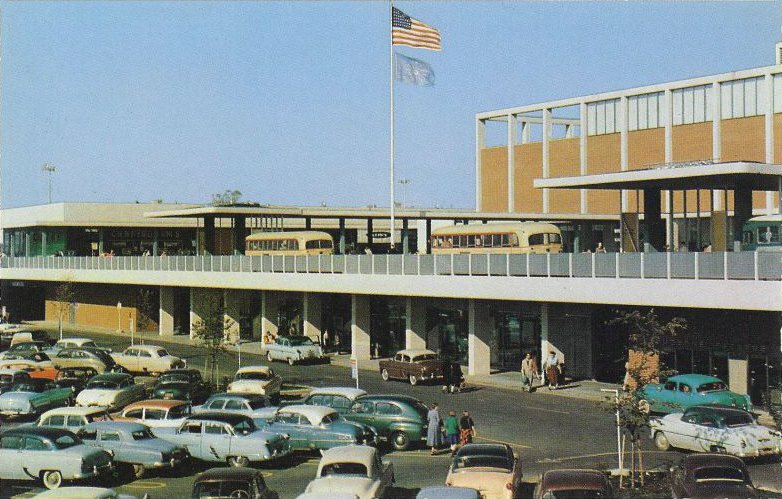 Baby Boomers who were Detroiters grew up with Northland as our landmark mall. Change is inevitable and Northland (which has been in decline for years) will finally be shuttered for good. An era is ending just as it’s original rival shopping district of downtown Detroit is revving up again. 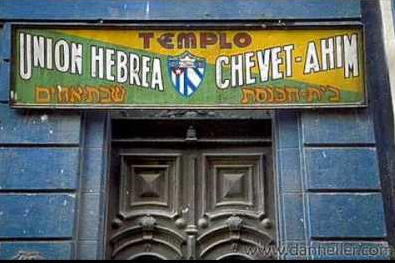 This week is a travel Shabbat message meaning I wrote it before our travels to Cuba so any interesting news of the week will be included in next week’s email. Columbus arrived to Cuba in 1492 and claimed it as part of the Kingdom of Spain till it became semi-independent in the first half of the 20th century but in 1959 Castro took hold and its been communist ever since… But a new chapter is beginning for this small Caribbean Island as the U.S. finally loosened diplomatic constraints opening the door for them to join the modern 21 Century. Wishing you a Sweet and Peaceful Shabbat Shalom! Condolences to Steve and Carol Tarnowsky and their family on the passing of Carol’s Dad, Ed Blumberg. May his memory, spirit and love bring comfort to his family and friends during their time of sorrow. Bravo to friend, Diane Orley, on helping to Shatter the Stigma of Mental Health with the well attended event last week that facilitated a discussion of Mental Illness on campus. Since the loss of their son, George Orley z”l, Diane’s focus and passion has been to shed light on this potentially deadly disease. She started on the campus of University of Michigan to help the plethora of students who suffer from some form of Mental Illness and joined forces with the Wolverine Support Networkhttps://csg.umich.edu/student-resources/wolverine-support-network which creates a peer led safe environment for all students. The stats are staggering. According to National Alliance on Mental Health, 1 in 4 college age students have a diagnosable Mental Illness. The pressure of college and entering adulthood exacerbates the condition, though Mental Illness can start at a much younger age. One of the main obstacles for seeking treatment is the stigma to just talk about your feelings with your friends or family. Mental Illness is like any other disease… Cancer, Diabetes, Broken Bones, but sadly many can’t see the symptoms as easily and they are afraid to discuss it, fearful they will be judged. We don’t judge Cancer victims or Diabetics; We need to enlighten ourselves to destigmatize Mental Illness too. 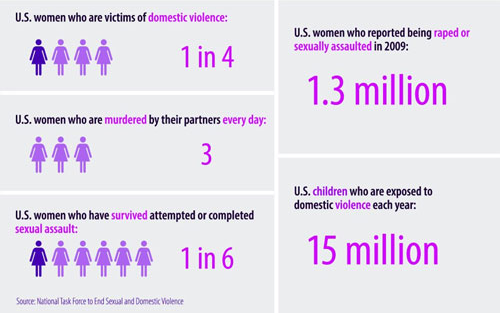 These are just US Stats; Globally it’s much worse. Alabama becomes State number 37 to legalize Marriage Equality as the Supreme Court stepped aside in blocking it. But, remember that crazy Judge Roy Moore in the 1990s who placed his own carving of the Ten Commandments in his courtroom and insisted on praying before Jury Selection despite our Separation of Church and State laws…well he’s back to his shenanigans again and this time as the Alabama Supreme Court Chief Justice. He instructed Alabama Probate Courts NOT to issue Gay Marriage licences (even though it is federally permitted) and many probate judges obeyed his bias dictate. This (State vs. Federal) battle will obviously continue to play out in the legal field, but I predict Marriage Equality will be legal in all 50 States before year’s end. With nearly 6,000 deaths,12,000 injuries and 1,000,0000 displacements, the situation is dire in the territorial Ukrainian war. It is especially harrowing for the over 300,000 Ukrainian Jews (20% live in the conflict zone) as the last time they were displaced from their homes was during WWII when the majority were killed by the Nazis. Hopes are high with this week’s Leader Handshake, but time will tell if Peaceful Minds prevail. Say it isn’t so..but alas it is. After 17 years, Jon Stewart has decided to stay home and have dinner with his family rather than entertain and enlighten us with his brilliant and hilarious interpretation of current events. 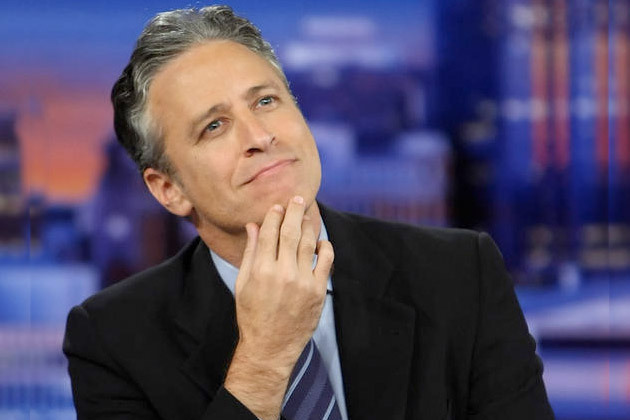 Jon is following a long line of hosts who have “abdicated”… Jay Leno, David Lederman, Stephen Colbert, Brian Williams (though his was a self-inflicted abdication) and now Jon Stewart. Whatever his next journey, he will be greatly missed on the Daily Show. Also, I don’t even think his film Rosewater ever made it to Michigan. One of his “rants” this week was this story of our obsession with Jordan’s King Abdullah and the comparison to our own leader. http://thedailyshow.cc.com/full-episodes/8omwbs/february-10–2015—david-axelrod#time=1m17s&index=0 But our own leader rose to the occassion by submitting a 3 year resolution to Congress to approve a War on ISIS (minus the ground troops) in Syria and Iraq. One way or another, ISIS and all terrorists need to be eliminated from this Earth. It would be nice to add ISIS obliteration to Obama’s legacy. Congrats to all the winners last week especially my favoriteSam Smith, Stay with Me: https://www.youtube.com/watch?v=pB-5XG-DbAA and shame on Kanye with his childish obsession of Beyonce. Wishing you and your loved ones a Sweet and Peaceful Shabbat Shalom and if you’re an SNL fan, don’t forget to watch the 3 hour 40th Anniversary reunion Show 8pm thisSunday Night (Live) with tons of guests like Betty White, Eddie Murphy and Robert De Niro. And while the stars are shinning, check out Monday night (8:00pm CBS) all-star tribute to Stevie Wonder’s LP hit, Songs in the Key of Life. And lastly, Happy Valentine’s Day to all who celebrate this day of love. Mazel Tov the the Bloom and Kravis families on the engagement of Jennifer Bloom to Drew Kravis. Wishing the young couple Health, Happiness, Love, Laughter, Peace and Prosperity. 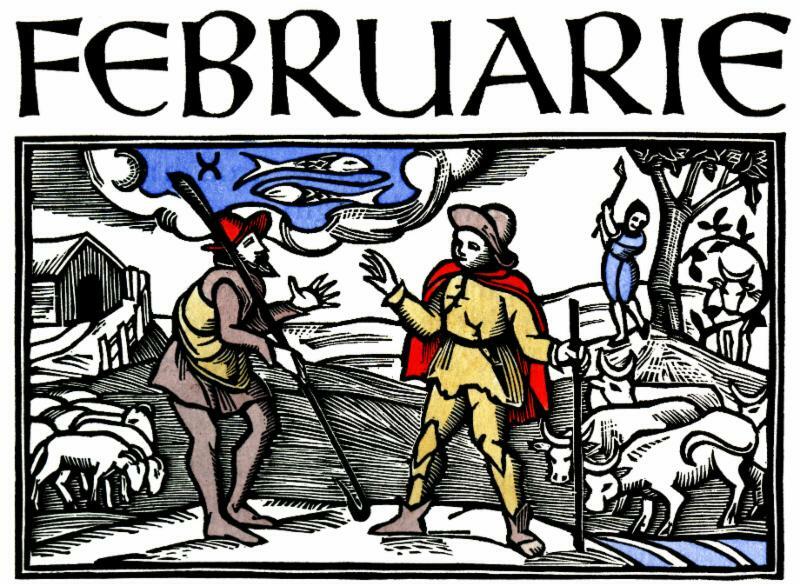 Welcome to February, well known for Punxsutawney Phil, Black History Month, Lincoln & Washington’s birthdays and Valentine’s Day. 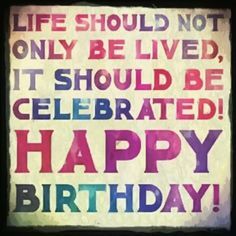 And lesser known (but still true) for Baked Alaska Day (Feb. 1st), World Cancer Day (Feb. 4th), Shower with a Friend Day (Feb. 5th) and Love Your Pet Day (Feb. 20th). http://nationaldaycalendar.com/calendar-at-a-glance/february/ It’s the month that gets the least respect as it is most often mispronounced. Do you say Feb-you-airy or Feb-ru-airy… though either is fine according to Webster’s Dictionary. Feb has come in like a Lion and hopefully will be weather-tamed as the days progress. 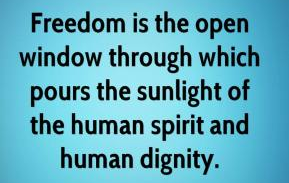 Despising Freedom and diversity fits the bill for the inhuman barbarian ISIS sickos who struck again this week with their torturous murder of the Jordanian pilot. When will the civilized world join forces against this evil entity. Sadly they continue to gain momentum with fresh recruits by attracting disillusioned young Muslims to their twisted mindset. not sure of his presidential legacy but I do like this quote. While eating at a vegetarian restaurant this past weekend, the owner (who is also a Chiropractor) struck up a conversation with us while holding his 8 month-old son. He proudly mentioned that all 6 of his children were unvaccinated and his method of keeping them safe was to ensure a healthy environment and diet. He ignored the fact that his “safe” environment isn’t keeping his community safe. A debate was attempted but futile since the growing anti-vaccine movement seems undaunted by scientific facts and the deadly implications of their misguided philosophy. Parental concerns over vaccinations originated in 1998 with the debunked and retracted research by Dr. Andrew Wakefield that also resulted in the loss of his medical license. There are various reasons for this rising trend…pure natural lifestyle, connection (falsely proven) to Autism, mistrust of the pharmaceutical industry and the fact that Today’s Parents never experienced the fear factor of the polio era. The only way to eradicate preventable diseases is by vaccinating the majority of our population so those who are immunocompromised (infants, elderly…) aren’t exposed to the disease which if contracted by a healthy person could be minor but if contracted by a weaker individual could be deadly. 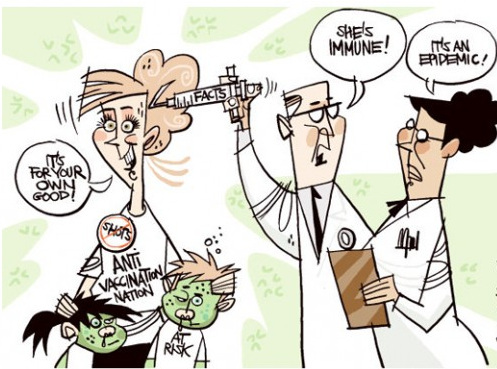 Those who don’t have a medical reason NOT to immunize their children are being selfish and oblivious to the danger. And now, 2016 candidates (Chris Christie, Rand Paul) are jumping into this conversation with some giving leeway to freedom of Choice. How can they suddenly be “pro-choice” when it is scientifically proven dangerous for Society. Of course, after backlash they seemed to have backtracked. Alberto Nisman z”l is coming to light as it now seems he was planning to submit an arrest warrant for Argentine President, Cristina Fernandez de Kirchner for her involvement in protecting Iran from their connections to the 1994 JCC bombing that killed 85 people. It would have been unprecedented to serve the president with a warrant for her arrest which makes his murder even more suspicious. 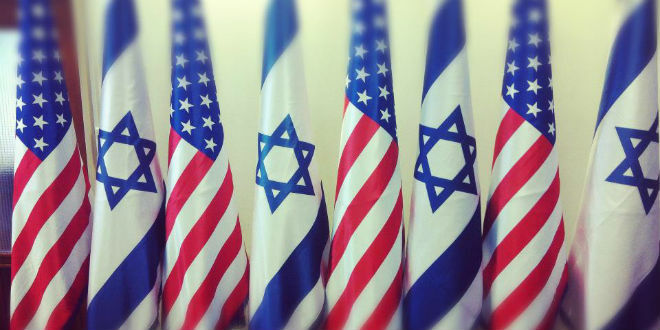 Israel should never be an American political football as bi-partisan support is the goal for our best Ally in the Middle East, but this is exactly what Bibi and Boehner have done with Bibi’s upcoming joint session speech next month (just 2 weeks before Israeli elections). 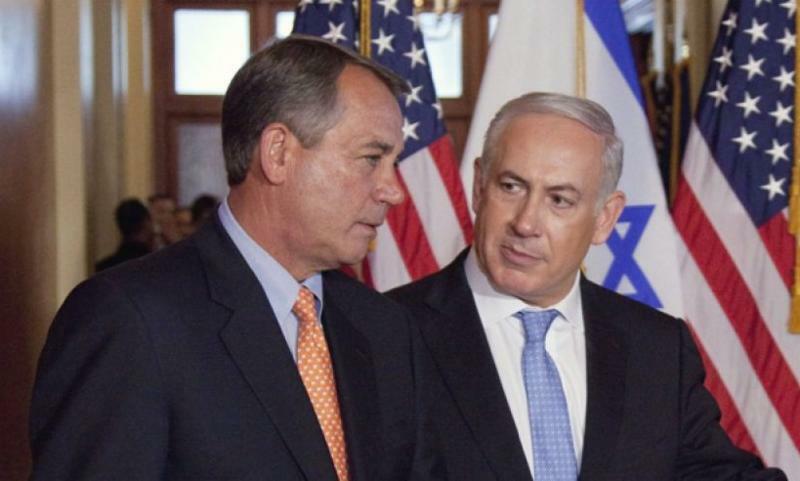 Boehner invited Bibi ignoring protocol and leaving the White House dismayed by Bibi’s acceptance. Yes, Iran is a threat to both the US and Israel but the process to halt their nuclear program is in the works. The last thing our Congress needs is more animosity between the aisle especially regarding Israel. Bibi is using the platform to prop up his prominence prior to his March 17th elections but will Israelis see through this propaganda. For the upcoming holiday of Valentine’s day and a mere $80, you can provide your loved ones with a 50 Shades Vermont Teddy Bears including “accessories”. http://www.vermontteddybear.com/sellgroup/fifty-shades-of-grey-bear.aspx?bhcp=1 To the many 50 Shades Fans out there (though I couldn’t finish the book), hope your “fantasies” come true as the film hits theaters this weekend. Bravo to Governor Synder (hospitalized this week with a blood clot) who decided not to appeal the court order that recognized the 300 gay marriages performed during the legal window. Those who were married that day have been in litigation limbo but are now legal and can benefit from all the rights connected to marriage, like insurance and adoption. A decision in April is due from the Supreme Court who will rule on Marriage Equality for Michigan and a few other states. Whether you are a Nursing Mom, Working Mom, Yoga Mom, Formula Mom, Cloth-diaper Mom, Hands-On Dad… All, have one thing in common which binds our souls. This (Super Bowl) commercial speaks loudly about our priorities as we should remember to loosen up on our judgements (unless your actions are dangerous to others). Congrats to cousins Dana and David Pagoda on the birth of their 2nd child, Drew Henry. Hugs and Love to grandparents,Tom and Rosanne Kukes and great-grandmother, (Aunt)Chilly Revich and Aunt, Uncle and cousins, Sherri, Danny, Chase and Lance Kukes. 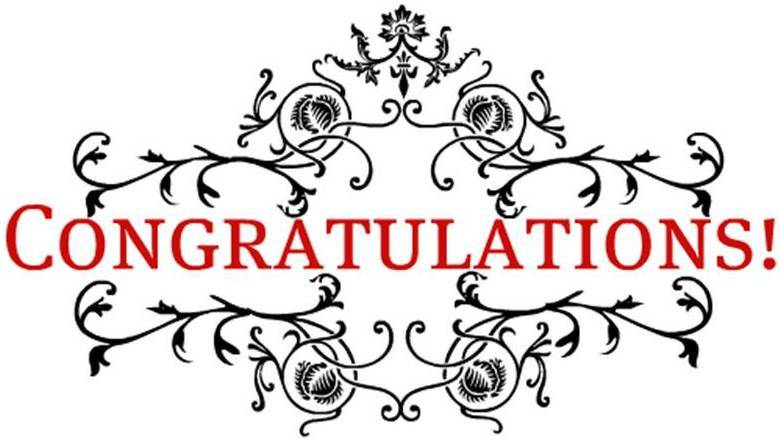 Congrats to our local 8 Over 80 honorees for their longstanding commitment to our community as they will be showered with praise on Sunday May 3rd: Honorable Avern Cohn, Dr. Paul Feinberg, Ellen Glen, Ellen Labes, Geri Margolis, Sondra Nathan, Bert Stein and George Zeff. 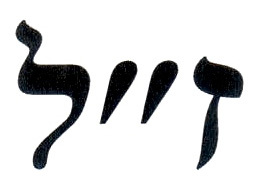 Condolences to the family of Aaron Kraft z”l, loving father toHelayne (Jeffrey) Kaplan, Valerie Ross, Bryan Kraft, and Risa (Bruce) Brickman. 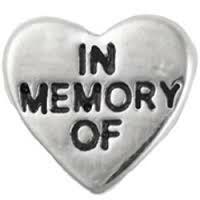 May his memory and love fill the hearts of those who mourn his passing. Condolences to Patti and Eric Phillips and their family on the passing of Eric’s father, Dr. Irwin Phillips. May his spirit and memory be a blessing to his family.